Services | Cognitive Marketing Inc. In the poem, Atlantis, by W.H. Auden, is the phrase: “Stagger on rejoicing.” Makes one wonder if Auden ever managed a brand rollout for a school. It’s not that brand is a struggle, per se, but it isn’t something that can be quickly checked off of a to-do list either. It’s a marathon not a sprint, and so some bit of “staggering” happens. As one of the most coordinated of efforts a school can take on, implementing a brand asks a lot from people on the advancement, marketing, enrollment, and senior leadership teams – the very people whose schedules are already packed and who have ample to-do lists. That’s where we come in. Cognitive’s “MO” is to bolster everyone’s efforts, for as long as needed and to whatever degree is necessary, to ensure success (and sometimes even rejoicing). We help engage faculty in the brand-building process. Sort through and make sense of the opinions of alumni from different generations. Motivate in-house writers to break through and produce the best stories of brand possible. 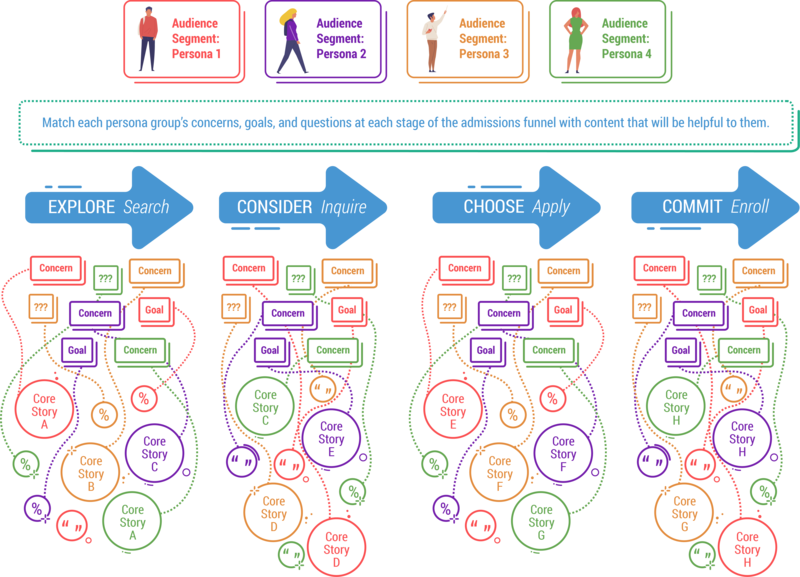 Below are the steps of a comprehensive brand, content creation, and integrated marketing process. Regardless of what implementation stage your school may be, you can count on the Cognitive team to assist in the way that works best for your team, your budget, and your schedule. It all begins with brand. A school does need to know the value of its brand before it can determine where it needs to go to enhance its reputation. Foundational research is key, to both understand what your constituents value about their relationship with you, and to know the degree to which future members of your school community think these same things. We conduct the full range of research necessary in our studies, and place a particular emphasis on qualitative research. Conversations with constituents are gold for us, providing the clues, if not the major revelations, that guide the brand development process. But, we can’t possibly speak to everyone, so here’s when quantitative research comes in. Constituent surveys validate what we learned on the ground, reveal additional insights, and serve as a pipeline for personal stories. Once the research is pored over, analyzed, mind-mapped, correlated, parsed, and reassembled, brand tools emerge. Strong brand tools provide a framework that reveals what a school is best at and the sort of person for whom that will matter. The tools shown in the diagram below each serve a specific purpose and guide the development of a school’s narrative. 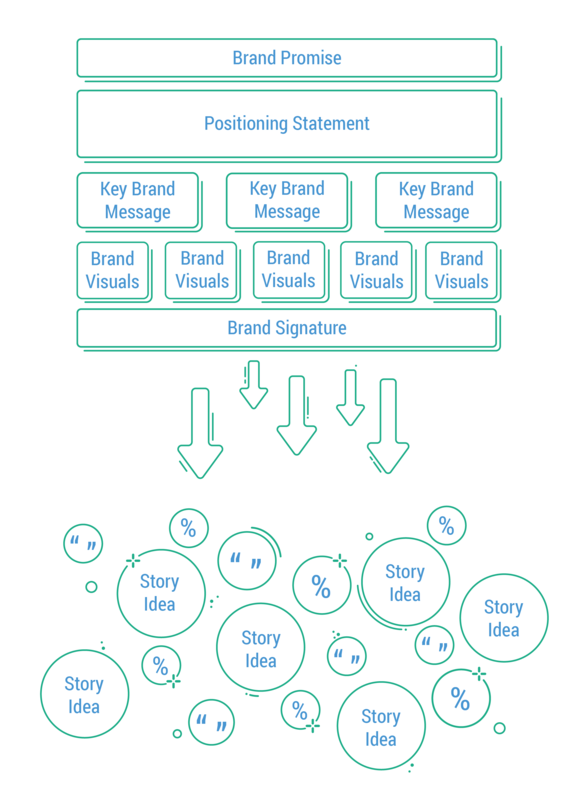 The discovery process of a brand study unearths a multitude of stories. Everyone at a school has one, and many are interesting. Some, though, are memorable. Distinctive. They provide a little chill up the spine. There’s always that one story (or two, or ten) that no one has ever heard before and, once heard, can never be forgotten. These are the stories that will resonate with those certain kinds of future students in ways that will change the trajectory of their lives. We know. We’ve seen it happen. 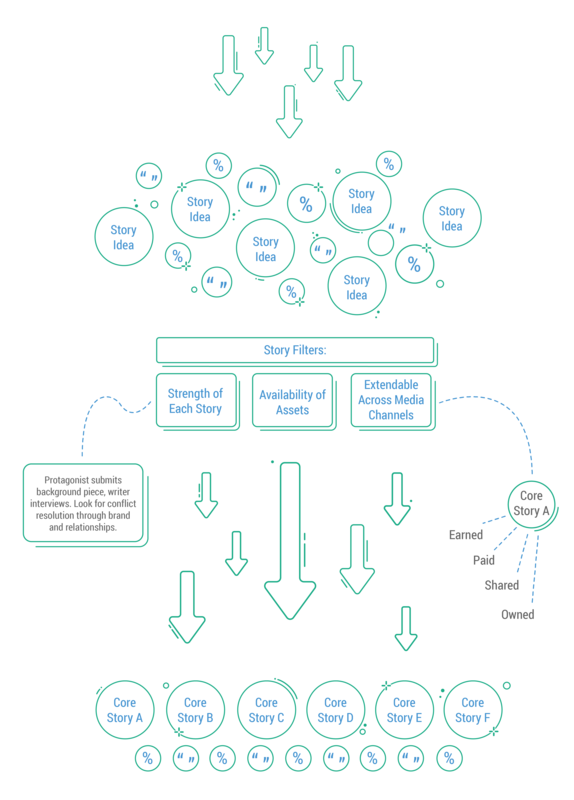 And we guide our clients to build a library of these core stories. Relationships Are Built With People. Think about the many people who would benefit by learning something about your school. What do they know about you and you about them? Under what circumstances will you be able to share a brand story with them? 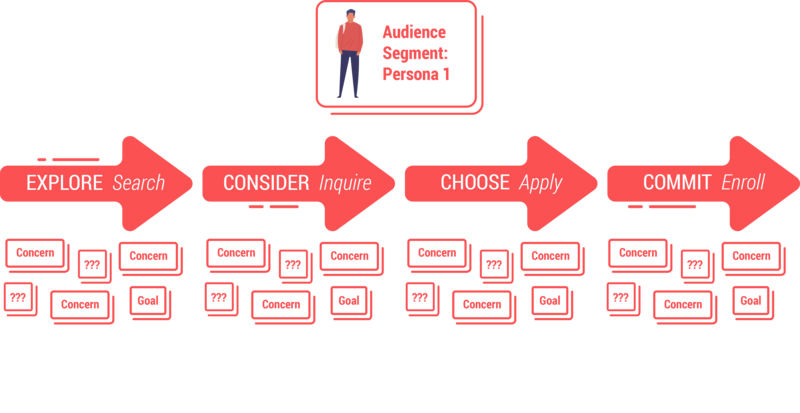 By identifying the various different audience segments with whom you will communicate and composing a persona for each group, you will then be able to communicate to them in meaningful ways–ways that will be helpful to them. Ways that will compel them to initiate a relationship with you. Understanding a person’s decision path. A junior in high school is in a different head space than a senior from that same school who is starting to receive college acceptance packages. Families in rural school districts have different priorities with regard to college than do those who live in urban centers. Young parents who are considering daycare versus full-day PreK (and, one day, a college prep high school) have to factor into their decision not just costs, but a school’s location, culture, and the quality of its academic offering– all while still engrossed in potty training. It is important to know what stage in the decision process your audience is in because this aligns directly with the kind of content you will want to share. Delivering the right content at the right time, to the right person. A school’s collection of brand stories, testimonials, and outcome indicators–its content–must be presented to audiences strategically. Each distinct persona has its own set of concerns, goals, and questions. Knowing what these are allows a school to deploy the right content to them at the time when it is most helpful. And, by utilizing the four media distribution channels–paid, shared, owned, and earned–in a synchronized way, each audience segment will encounter this information of value (sponsored by your brand) at a time when they will be the most receptive to it. Servicing the marketing needs of each school. Clients praise the team at Cognitive Marketing for our ability to steer their in-house teams toward a more strategic way of thinking–and implementing– their overall marketing campaigns. Our phased and highly customized approach incorporates the tools already in place and maximizes the contributions of the people already in-house. And, we invigorate constituents campus-wide. We see positive energy build when people of a school share an understanding of a school’s strengths and tell brand stories with a confident voice. If the idea of building brand and marketing your school with a collaborative partner appeals to you, be in touch with us. We’re here to help!